Techbuy Pty. Ltd. ABN 15 051 723 123. Techbuy Pty. 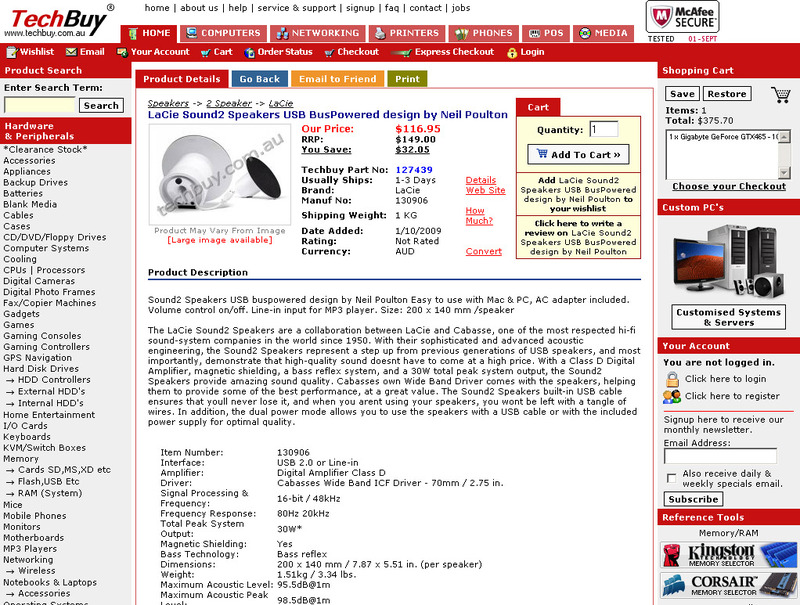 Ltd. is an Australian owned and operated company specialising in the sale of popular brand name computer peripherals. Based in Sydney, New South Wales, Techbuy is taking ecommerce sales and support to another level, incorporating everything you need as a customer to make the right decisions when purchasing. The wide range of products allows Techbuy to provide a one-stop solution for all computer & communication products and peripherals. All of our products are sourced from reputable vendors including Sony, Microsoft, Creative, Canon, Brother, Konica Minolta, Samsung, Lenovo, Toshiba, Hewlett Packard, Cisco, DLink, LG and many others. 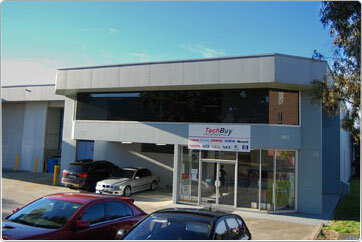 TechBuy stocks and distributes a wide range of networking equipment, printer consumables, mobile phones, monitors, printers, scanners, storage solutions and networking equipment as well as complete computer systems and custom built computers. With 185807 products currently in our database (and with our product range literally growing and updated everyday), we are able to reduces the time you spend searching for products around the internet helping to save your time and money. Techbuy caters to businesses, individuals, education and government organisations. It really has never been this simple to buy quality, brand name computer products on-line. We're excited, and we think you will be too. You will be pleasantly surprised with the entire Techbuy package. We redefine online shopping with a massive, varied product range, secure purchasing, speedy delivery and great customer service - because you are important to us. Backed by over ten years experience - If you are new to online shopping you are in good hands. If you are a veteran let us show you how it should be done. What are you waiting for, try the Techbuy difference today. Over..
With a choice of phone and email support we are here for when you need us. Should any problems arise relating to your order we will promptly notify you and rectify it! You will also receive update emails regularly up to and including a shipping notification email. With over 140,000 products in our database and new products being added daily we have all your technology needs covered. If you can't find an item, or would like us to list a product that we currently do not have, please contact our friendly sales staff for assistance. To our many thousands of dedicated shoppers, the number of different looks the Techbuy web site has portrayed over the last couple of years will come as no surprise. 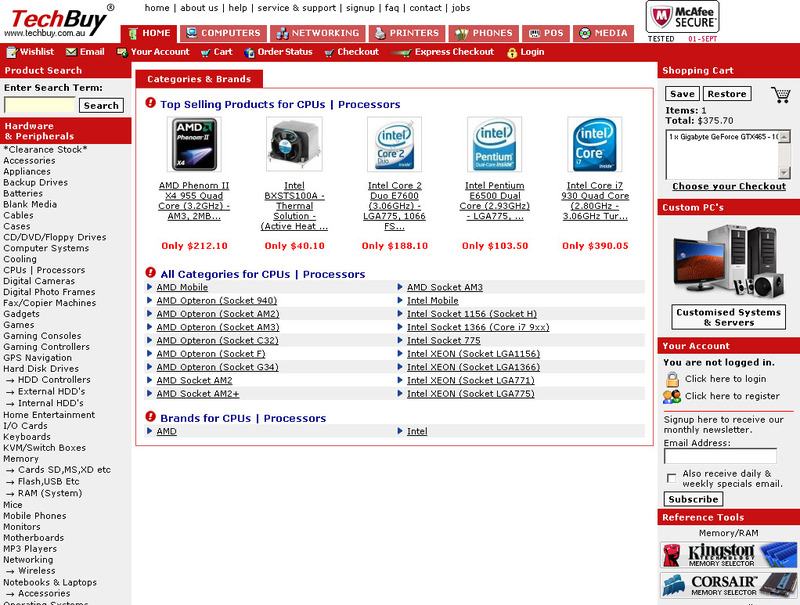 The Techbuy site is always changing to keep up with the look and feel of current trends. Each new design represents the growth of the site as a whole, and each design has been totally re-developed to include easier navigation, new features and even more products. The Current Design: The current design went live on 24th August 2010. The Constantly Evolving Design: The previous design did not go live on any actual day, but was an ongoing version of our previous layout, with a myriad of changes to improve speed and formatting across browsers as well as functionality overhauls and changes to the 'look & feel' of the whole site. This was still occurring, up until the new design was pushed live on 24th August 2010. 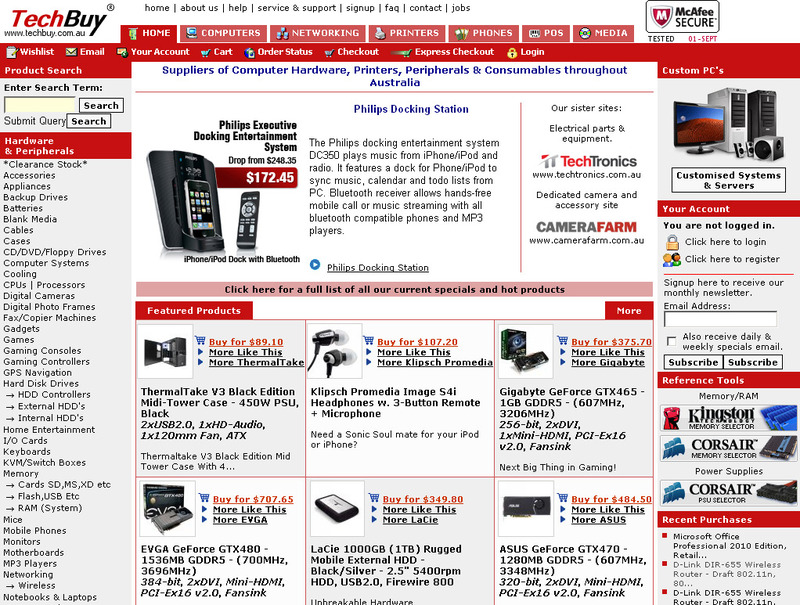 The Final 2001 Design: This Techbuy site design went live to the public on 16th Nov, 2001. The design reflects the changing nature of the web and the availability of a wide-acceptance of browser standards such as Cascading Style Sheets and DHTML. The previous design was optimised for Internet Explorer V6+; however, it still runs fine under NS4+ and IE4+. The Original Revamped Design: This Techbuy site design went live to the public on 23rd June, 2001 and was ripped down on 15th Nov, 2001. This design was developed to allow our product specialists to add featured products to the front page using our administration system. This design was based on customer requests and all of the ideas from the Techbuy designers and developers. The Initial Design: The initial design was rather simple compared to the current design and didn't have nearly as many features. Although it was simple, the initial design seemed to be very popular with our shoppers: There was a category listing, some live help and product details, that was it. No drop-down menus, no Techbuy inbox, no forums...not even an express checkout! This design was made obsolete on the 22nd of June 2001.